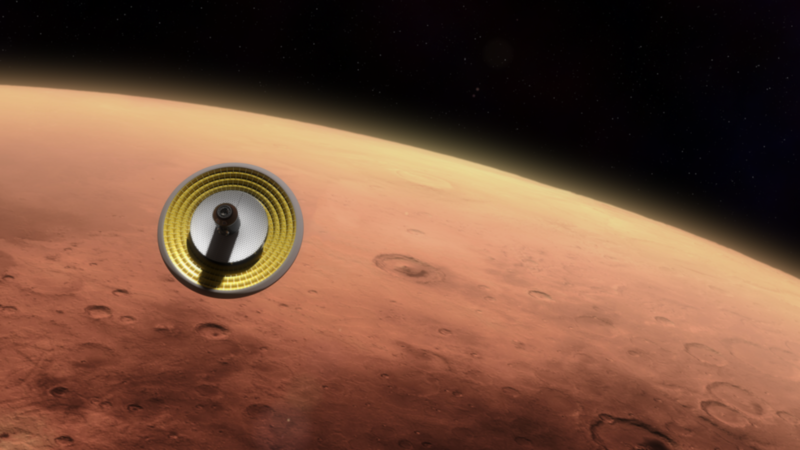 September 19, 2015 – NASA is giving university and college students an opportunity to be part of the agency’s journey to Mars with the Breakthrough, Innovative, and Game-changing (BIG) Idea Challenge. NASA’s Game Changing Development Program (GCD), managed by the agency’s Space Technology Mission Directorate in Washington, and the National Institute of Aerospace (NIA) are seeking innovative ideas for generating lift using inflatable spacecraft heat shields or hypersonic inflatable aerodynamic decelerator (HIAD) technology. The NASA’s Mars Curiosity rover is the heaviest payload ever landed on the Red Planet — weighing in at only one ton. To slow a vehicle carrying a significantly heavier payload through the thin Martian atmosphere and safely land it on the surface is a significant challenge. NASA is addressing this challenge through the development of large aeroshells that can provide enough aerodynamic drag to decelerate and deliver larger payloads. HIAD technology is a leading idea because these kinds of aeroshells can also generate lift, which would allow the agency to potentially do different kinds of missions. Interested teams of three to five undergraduate and/or graduate students are asked to submit white papers describing their concepts by Nov. 15. Concepts may employ new approaches such as shape morphing and pneumatic actuation to dynamically alter the HIAD inflatable structure. Selected teams will continue in the competition by submitting in the spring of 2016 full technical papers on the concept. Up to four teams will present their concepts to a panel of NASA judges at the BIG Idea Forum at Langley in April 2016. Each finalist team will receive a $6,000 stipend to assist with full participation in the forum. BIG Idea Challenge winners will receive offers of paid internships with the GCD team at Langley, where they can potentially work toward a flight test of their concept.